In this troubled economy, there still lies a respite of affordable crap. Perhaps you are looking for 2 year old Boston Baked Beans, Dora the Explorer party napkins, super glue, a shot glass with the Virgin Mary on the front, and glow-sticks. There is literally nowhere else in the world that you can purchase all these things in one trip---except Dollar Tree. These women entering the store are far too skinny to shop here...they must be employees. Of all the Dollar stores I've frequented (out of 3), Dollar Tree is by far the most clean and well-organized. I visited a small store called Dollar House which was obviously still cleaning up after Hurricane Katrina. (Even though the store was 10 states away, and 3 years had passed) There were items all over the floor, and randomly tossed on the shelves. I couldn't believe the mess as I pushed the cart over dishes, koosh balls, and lemon heads. It then occurred to me, that it didn't matter---everything costs a dollar. There needs to be no rhyme or reason to a dollar store. I think they should have renamed the store Dollar Storm. We have used the dollar store as a reward when our kids do chores or need to get out. Some parents promise Disneyland or the Zoo. We promise ring-pops and 101-packs of bazooka bubble gum. I embrace my white-trashness. There are a few negatives to Dollar Tree. Other stores have a sign that indicates No Shirt, Shoes, no Service. (NSSS) Dollar Tree follows the SSSN policy. Shirt, Shoes, Showering Not required. If you feel a little squeamish shoving your ham hocks through the aisles at Walmart between 4 riding carts, and 1400 pounds of fleshy buttery goodness, you really need to stay away from Dollar Tree. Imagine that George Lopez eats Cedric the entertainer. He then dies, and his 500 pound body begins to bloat and stink. He then miraculously comes back to life. Chances are, that he'll get a hankering for imitation cheese puffs and a helium-filled balloon...which means he'll be standing next to you at Dollar Tree deciding between a scented candle or a lighthouse calendar. 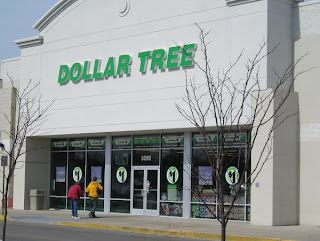 I do think that Dollar Tree may regret their name choice in a few years. What if inflation is so great that they need to start charging 1.10 for every item. Dollar (and ten) Tree doesn't quite have the same ring. In fact, they should just wait until they can raise all prices to 2 dollars. Double Dollar Tree still has some pizazz. Dollar Tree nickles and dimes its way to a 3-star rating. What I never understood was how some things cost more than $1. Gotta pay $2 for the premium stuff.